O.C. Litigation Lawyer Will Roll Up His Sleeves And Work For You! Finally! A Lawyer with BOTH your goals and checkbook in mind. Lawsuits Prepared & Defended, Contract Litigation, Expert Debt Collection when you absolutely must be paid, Collection Defense when pursued by ruthless debt collectors. 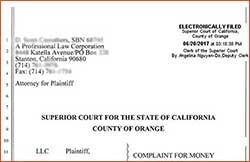 Moreover, I am the Orange County Demand Letter Attorney -- your GO-TO lawyer for fast, affordable and effective 'Lawyer Letters'. 60% of disputes are solved by a Demand Letter without going to Court! I will write a legal 'Demand Letter' to help you get action or collect money owed you. No client is too small and no adversary is too big! When necessary, I can represent you in Court to protect your rights. Orange County Litigation Attorney Who Rolls Up His Sleeves and Works For You! I am Orange County litigation attorney John J. Hamilton. I am solo lawyer practitioner who handles every client’s matter personally. I am a roll-up-the-sleeves, hands-on Orange County attorney. I do not employ any other junior or associate attorneys. I do not farm my work product to and paralegals nor legal secretaries. My legal clients can expect that I will personally write every legal letter and legal document, make every phone call, return every phone call; and conduct any trial, any courtroom litigation (if necessary) on a client’s behalf. When you hire me, you get only me. When you are being sued personally, or as a professional person, you have questions. Or, if your business has been sued or is contemplating filing a lawsuit to protect its interests, you will need the help of a skilled litigation attorney. Individuals and small business owners are dear to my heart and my law practice. Call me! In addition to having affordable fees, I have a unique combination of real world business experience and the honed legal skills necessary to obtain the most favorable possible outcome for my clients. If vendors, sub-contractors or businesses you deal with fail to perform, fail delivery of goods, or broke a non-compete agreement, you can hold them liable for any financial harm or other harmful results. I routinely represent individuals and businesses in Orange County and surrounding counties. If you’ve been sued, recently served a civil litigation summons, I fully understand that the legal issues you face may threaten the very survival of your business. Rather than go to bed another night worried and anxious, call me. Let’s talk over your circumstances and see if we can make lemonade from the lemons you are now facing. REAL WORLD EXPERIENCE – Prior to earning a law degree in 1993, I had over 20 years experience in the securities, insurance and banking industries including being Senior Vice President of one of the nation’s largest financial institutions in the 1980’s. This prior business experience gives me not only a legal perspective but also a practical business perspective in seeking solutions to clients’ legal problems. If someone has failed to perform as epected – failed to provide services, failed to honor an agreement, failed to deliver a product, or owes you money, a demand letter will not only be likely to solve the problem quickly and affordably, a demand letter is a necessary first legal step to protect your rights. A demand letter is a letter is written by a skilled attorney on behalf of a client where the lawyer demands that the recipient of the demand letter take (or cease) an expected action. That said, you DO NOT want to write a demand letter yourself, and I’ll tell you why! Served a Debt Collection Lawsuit ? Are you being sued by a debt collector? Winning a debt collection lawsuit is possible by finding and exploiting a technicality in their case – their summons and complaint filed against you. I believe, and have personal experience prior to obtaining a law degree at age 45, that an individual can often save substantial money by doing certain things without a lawyer. However, when it comes to a person representing oneself in court and particularly at trial, neither the courts nor the juries take a person as seriously when representing oneself and in litigation, a person should hire an attorney to make sure their rights are protected and asserted fully. I am very willing to review documents prepared by clients and have done such work for over 15 years. I have been the ‘ghost writer’ of court documents for clients that wish to represent themselves. Examples include writing summons, complaints, responsive pleadings (e.g., Answer to the complaint), and “discovery”, both demanding discovery and responding to discovery. You need a lawyer that focuses his practice on only a few subject areas and one of those subject areas should be the area that you need representation in. A lawyer that claims to practice all — or nearly all — areas of the law is probably a “jack of all trades but a master of none”. I work for myself to the benefit of my clients! – I do not rely on others to do work which, so often, does not measure-up to my standards. That personal dedication means that you are getting the best representation possible. The 25-years of business experience I had prior to earning a law degree, involving contract disputes, employee/employer litigation, breach of employment contract, fraudulent business practices by companies, and claims by investors of stockbroker fraud, inspired me to not only go to law school mid-career but to pursue the specific areas of practice where I had actual hands-on business experience earlier. Local knowledge is important to the extent of knowing the reputation the judges within the legal community and adopting to that judge’s style when writing motions and appearing in court. There are some judges an attorney may very well want to file a pre-emptory challenge to disqualify the assigned judge in the case. I’ve done it twice in the past four months. When we meet I will do is a general determination if the you have a winnable case. Second, I will give you a ball-park figure of how much it will cost to proceed with the case under alternative scenarios. When you prepare to meet please be sure to bring all documents related to the issues for which services are requested. Better yet, before the first meeting, you should either fax or email with a PDF attachment (if able to do so) the documents related to the issues.